After a long wait, it is now official - Verizon will offer the HTC One starting on August 22, both online and in stores. 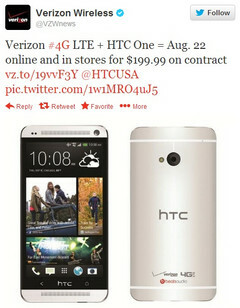 In a Twitter announcement posted earlier today, Verizon confirmed that the HTC One smartphone will be available on its network starting on August 22. Offering support for the carrier's 4G LTE network, the Android-powered smartphone features a 4.7-inch Full HD touchscreen, a quad-core Snapdragon 600 processor, 2 GB of memory and 32 GB/64 GB of internal storage. HTC's flagship also provides Bluetooth 4.0 connectivity, WiFi 802.11 a/ac/b/g/n, support for infrared remote controls and many more, all housed inside a sleek aluminum body. Priced at $199.99 (together with a two-year service agreement), the HTC One will join Verizon's network about one week before the Moto X, rumored to arrive on the 29th of August. Unfortunately, the pricing and availability of HTC One handsets from Verizon's online and retail stores free of contract are yet unknown.